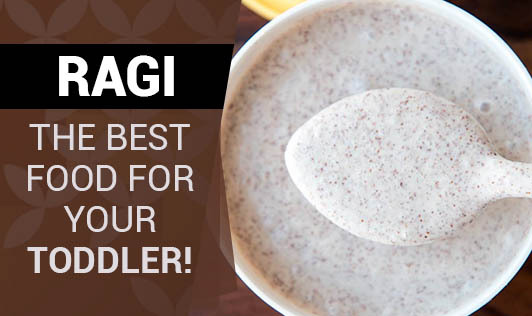 Ragi, The Best Food for Your Toddler! Ragi is the staple food in many villages across South India. It is exclusively fed for toddlers to develop strength, stamina, strong bones and good growth. Apart from ragi being rich in calcium, it has 10% proteins with negligible amount of fat. It is rich in fibre, vitamin E, B-complex vitamins and minerals like iron and magnesium. It is an excellent food for toddlers when compared to the local brands available in the market. • Sprouted ragi (Sprouting improves the nutritional value of ragi). • Dry them in the sun. • Dry roast them to remove extra moisture. This will make them pop and look like tiny popcorns. • Make it into a fine powder and store it in an air tight container. Using this ragi powder, you can make porridge(seri) using milk. You can also add mixed dry fruit powder to this porridge. To give a twist in the taste, instead of milk and dry fruit powder, you can add mashed dal and vegetable broth while making the porridge. Your kid will love the taste of this nutritious dish!